Cheltenham's School of Industry was founded on May 19th, 1806, by Queen Charlotte, wife of George III, for 'female orphans descended from respectable parents.' As well as being its patron, the Queen contributed financially to the institution, as did several other members of the Royal Family. During its early years, the School occupied a thatched barn off the town's High Street, a location known as the Queen's Buildings. The premises included a schoolroom, kitchens, dormitories and a committee room. In addition to training orphan girls for different types of work, the institution provided shelter to poor and friendless non-orphans, and offered protection to girls who were in moral danger. Cheltenham Orphan Asylum for Girls, Cheltenham, early 1800s. 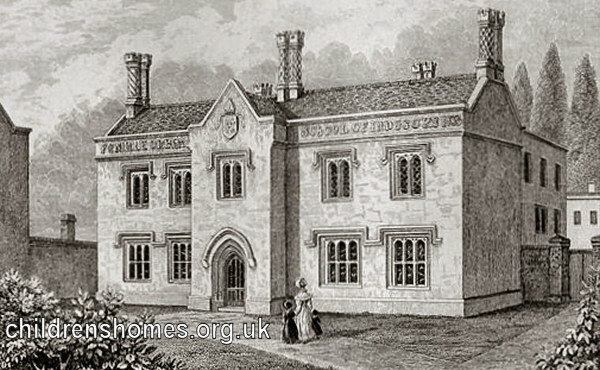 In 1823, the School moved to new purpose-built premises on Winchcombe (or Winchcomb) Street, Cheltenham, and now formally adopted the name 'Female Orphan Asylum'. The new building could accommodate 24 girls. The Winchcombe Street site is shown on the 1903 map below. Female Orphan Asylum site, Cheltenham, c.1903. 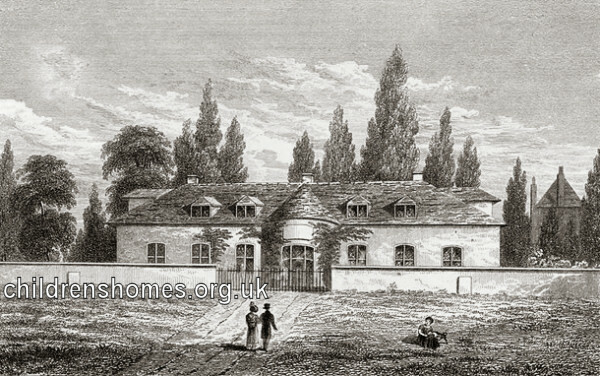 Female Orphan Asylum from the west, Cheltenham, c.1840. As well as basic education, there was strong emphasis on religious instruction. However, the main focus of the institution remained training the girls for future employment as domestic servants. Each girl spent six weeks at a time learning the skills of a particular role such as laundry maid, house maid and upper maid. Inmates were kept until about 18 years of age, when a situation in service was provided. The inmates of the Asylum wore a uniform comprising a brown serge gown, a cape and bonnet, black stockings and shoes, a check-patterned pinafore, and a 'duffield coat'. No payment was required for entry but candidates had to be between the ages of 7 and 11, and recommended by one of the institution's life governors or subscribers. Elections for admission took place twice a year. Applicants needed to provide certificates of the child's birth and baptism, the parents' marriage and death, and a declaration from the clergyman of the parish where parents resided of their respectability and the good conduct of the child. Also required were a medical certificate of vaccination, and of freedom from infectious disorder, fits, and organic disease, and a declaration from relieving officer of the parish where the child had resided that she had not been an inmate of the workhouse. In 1906, its centenary year, the establishment was renamed the Cheltenham Girls' Orphan Asylum. The name was changed again in 1923 to the Cheltenham Girls' Orphanage. In 1930, the running of the home was taken over by Gloucestershire County Council, with the girls now attending local schools. A further change of name, to Charlotte House, had taken place by 1953. The institution finally closed in 1958 and the building demolished.